This is a sponsored post for Dorothy Lynch dressing & condiment. All thoughts and opinions are my own. Everyone should have a great nacho recipe up their sleeve. This one is mine – and it could be yours, too! These game day pulled pork nachos are ideal for tailgating, or any football-viewing or Super Bowl party. 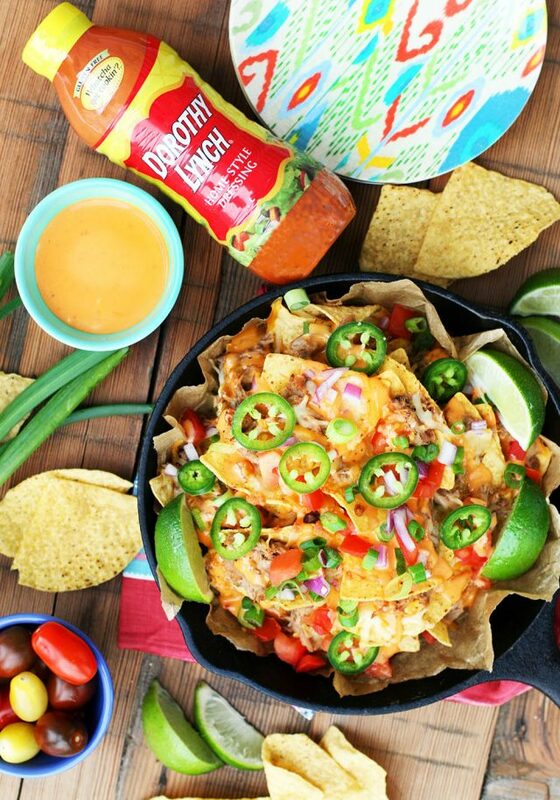 But let’s be honest: Nachos are great for any party or get-together. Or even just a weeknight dinner. Layer: Make sure most chips have toppings, not just the top layer. To do this, place a layer of tortilla chips at the bottom of the pan, and add toppings. Then add more chips, and more toppings. Aim for three layers of chips and toppings. Don’t skimp on the meat: These pulled pork nachos are hearty – I definitely didn’t skimp on the meat. Don’t be afraid to add some meat to most of the chips, ensuring every bite is a meaty one. Aim for contrast: Nachos have a tendency to be really heavy and one-dimensional. To avoid this, make sure your nachos have plenty of contrast: Meat, cheese, veggies, herbs, spice, acid, sauce, etc. Add sauce: The most important component of great nachos, in my opinion, is the sauce. And I’m not talking about salsa (although by all means, serve salsa on the side!) A great sauce ties everything together. This sauce makes the nachos. It’s creamy, tangy, and a little bit sweet and spicy. It’s super easy to make, using just three ingredients. The Dorothy Lynch dressing & condiment adds the flavor and sweetness. The mayonnaise adds creaminess. And the hot sauce adds the heat. One of the reasons I like Dorothy Lynch dressing & condiment is that it can be used in many different ways – not just as a salad dressing. I use it to create a flavorful chicken marinade and as the base of many different sauces to be used on everything from pizza to sandwiches to this nacho sauce. The dressing is available in original Home Style or Fat Free (I used the original). It’s also gluten free and made in the Midwest. Wondering where to buy it? It’s available at Hy-Vee, Walmart, and many locally owned grocery stores. It can also be purchased online. More recipes can be found on www.dorothylynch.com. Make pulled pork sandwiches: Toast hamburger buns, top with pulled pork and extra nacho sauce if you have any. Make a BBQ pork pizza: Mix pulled pork with some barbecue sauce. Top pizza with pork, red onion, banana peppers, and mozzarella cheese. Make a salad: Top lettuce with pulled pork, tomatoes, vegetables, tortilla strips, and Dorothy Lynch dressing & condiment. Now go, make these nachos, and impress your football-viewing-party guests. If you make them, don’t forget to tag #CheapRecipeBlog to share your creation! 1: Make pulled pork: Using a fork or small paring knife, poke 20 to 30 holes in the pork. Combine all spices, and using hands, rub it into the meat. Place meat in slow cooker. Add cooking liquid. Cook on low for 7 to 8 hours. 2: Remove meat from slow cooker and allow to cool until safe to handle. Using a fork, shred meat. Set aside desired amount of pork for the nachos (I used approximately 2 cups). Refrigerate or freeze the rest of the meat. 3: Make sauce: Combine sauce ingredients in a small mixing bowl. Add desired amount of hot sauce, if any. 4: Assemble nachos: Line a large baking sheet with parchment paper. Place one layer of tortilla chips on the bottom. Top individual chips with a bit of pork, cheese, and onions. Add another layer of tortilla chips and repeat twice, so you have three layers. 5: Preheat oven to 350F. Heat nachos for 8 minutes, until chips and toppings are warm and cheese is somewhat melted.